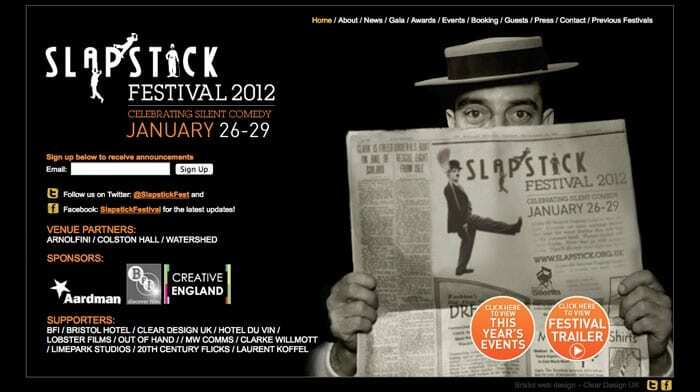 Slapstick 2012 - Slapstick | Bristol's Silent Comedy Festival. Bristol’s Slapstick Festival returns for an eighth incredible year, bringing laughter and hilarity to Bristol in the dark, early days of the New Year… just when we need it the most! Slapstick Festival is returning to Bristol and it’s bigger and better than ever with seventeen unique events forming our most exciting and diverse programme yet. We are welcoming some very special guests to the festival for the first time including writer, performer and television personality Griff Rhys Jones who is hosting our annual Gala at Colston Hall and Monty Python’s Terry Jones, who, along with Sanjeev Bhaskar and ‘Seventh Python’ Neil Innes will present a special screening of Monty Python’s ‘Life Of Brian’ (1979) at Colston Hall on Saturday night. Other highlights include our opening Thursday evening show at Colston Hall with Ian Lavender (Private Pike) as he reveals the inner workings of Dad’s Army from the inside out. Plus, many of our much-loved festival patrons will be returning to share their passion as we celebrate some of the finest and funniest moments in silent and visual comedy. This year we are championing that great master of the stone face expression and extraordinary comic performer Buster Keaton in a series of special events at different venues that highlight a selection of his finest – and funniest – work. A specially commissioned score will premiere at our gala event at Colston Hall, which will add a new, magical dimension to Keaton’s bonefide masterpiece ‘The General’ (1926). We are delighted to announce Pierre Etaix that great french ‘silent’ comic whose finest work from the sixties is appropriately experiencing somewht of a renaissance at film festivals across the world at the moment is coming to the UK in person to be the fourth recipient of our annual Aardman/Slapstick Award for ‘Excellence in Visual Comedy’ and to attend two special events we are presenting in collaboration with Bristol’s Festival of Ideas. So , we consider this our finest programme yet, the perfect antidote to escape the short days and bad news and have a laugh at Slapstick!